We all use our hands constantly for tasks ranging from eating, to typing on our smartphones, to cleaning, to preparing paperwork. These various movements depend on many muscles and ligaments, which are at risk for injury. Pain between the thumb and index finger is a common complaint, but is often not a serious issue. Many times, it is caused by some type of repetitive motion such as writing. However, there are some more serious conditions that may require more intensive treatment. Let’s take a closer look strains and injuries to the area between the thumb and index finger. What Causes Pain Between Thumb and Index Finger? Aside from any minor aches and pains from using your hand for a particular repetitive task, you can experience severe pain caused by various disorders and injuries. Let’s examine the four most common situations for pain between thumb and index finger. Over time, the cartilage in your bones wears away, affecting the movement of your joints and forcing them to grind against each other. This is what causes the pain of arthritis. The more you use a joint, the more damage is done, as is the case with your thumb. Also referred to as thumb arthritis, basal joint arthritis has the common symptoms of pain between thumb and index finger when grasping, thumb pain and tenderness, swelling of the thumb, and stiffness. 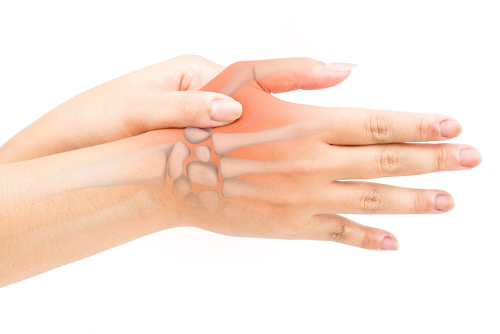 Affecting the arm and hand regions, symptoms begin as a sensation of numbness or tingling, before quickly turning to severe pain between thumb and index finger. You can also experience weakness in the affected wrist or hand. Carpal tunnel syndrome is caused by the median nerve in your wrist being pinched or compressed. This can occur due to a variety of factors, including wrist fracture, nerve damage, fluid retention, and inflammation, so it is seen in patients with hypothyroidism, rheumatoid arthritis, diabetes, and pregnancy, for example. It is also very common in people who have jobs involving repetitive movement. Thought to be caused by repetitive movement of the hand and wrist, this condition affects the tendons in the thumb, alongside your wrist. You experience severe pain when your hand is grasping or reaching or is in a fist position, or when you turn your wrist. When the tendons are irritated, it is difficult to move the wrist and thumb and swelling may occur. The pain and swelling are mostly located at the base of the thumb. Skier’s thumb is an injury to the ligaments, or soft tissue, between the bones of the thumb. Even though it happens most often in skiing accidents, the skier’s thumb injury can happen anytime the thumb is forced to the side or backward. Approximately 8%-10% of all skiing injuries result in this medical condition due to the forceful impact of the hand hitting the snow in an outward motion in a fall. It is also seen in car accidents when the thumb is stretched out over the steering wheel at the time of the crash. Symptoms appear several hours after the impact in any accident. Sufferers usually have pain between the thumb and index finger, thumb swelling, pain in the wrist, bruising on the thumb, and difficulty moving or grasping with the thumb. As with any painful injury or condition, it is important to know the proper pain management plan and how to implement it for a quick recovery. If you have any of the symptoms we’ve mentioned, talk to your doctor about getting a diagnosis and about what pain medication, therapy, or treatment is best for your particular case. In the meantime, let’s look at some treatments that can help with the pain associated with the four most common injuries of the thumb. Basal joint arthritis has no cure; however, you can take measures to relieve the discomfort and pain between thumb and index finger. Avocado soybean unsaponifiables (ASU), herbal supplements, have been shown to reduce inflammation. Two major independent European studies, conducted between 2003 and 2008, have shown that ASU could prevent cartilage breakdown while stimulating repairs and also reduce use of pain relievers. Self-massage of the affected area has been shown to improve dexterity and reduce pain in basal joint arthritis sufferers. Journal of Bodywork and Movement Therapies published a study in 2007, in which two groups of arthritis sufferers were given either massage therapy or regular treatment. The massage group received massage treatments and were taught to do self-massage over a four-week period. Self-massage is done by rubbing the arthritis-affected area firmly with long strokes to warm up the muscle before switching to smaller strokes directly on the painful region. You should also consider standard treatments for basal joint arthritis. A splint can reduce pain while maintaining position of the wrist; you can get these at most pharmacies or from your doctor. Your doctor may prescribe pain relievers if over-the-counter medication does not help. You may also need corticosteroid injections or surgery in cases where no other treatment improves your condition. Some surgery options are joint fusion, osteotomy, joint replacement, and even trapeziectomy, where the small bone in your wrist is removed. Carpal tunnel syndrome treatment usually just consists of time, as it can heal on its own, but there are some home remedies you can try as well. To relieve the inflammation and pain that accompany carpal tunnel syndrome, you can place a towel-wrapped ice pack on your wrist for 10 minutes. Before bedtime, apply heat to the affected area by having a warm water hand bath. Natural supplements and herbs can also help relieve symptoms of carpal tunnel syndrome. Topical arnica can be applied in the morning and at night on your wrists; gently massage the ointment into the region. St. John’s wort, bromelain, and curcumin supplements and flaxseed oil, can help ease pain and inflammation. For the supplements, follow the instructions on the package. You can get bromelain through pineapple and curcumin through the spice turmeric, but these ingredients are more effective in straight supplement form. When it comes to the flaxseed oil, take a tablespoon every day; if you have trouble taking it straight, you can try adding it to a smoothie, yogurt, or salad dressing (just don’t heat or cook it). You may have to wait a couple of weeks before seeing any impact on your symptoms. To further help with the pain, it is recommended you wear a splint on your wrist at night. You might have to get corticosteroid injections if other methods aren’t working. If the pain persists for more than six months, you may require surgery. De Quervain’s tenosynovitis can be treated with over-the-counter pain relievers as well as corticosteroid injections. At home, you can splint the wrist and thumb to prevent movement and use ice compresses to help reduce pain and swelling. Muscle exercises may be part of your work with a physical therapist, should you be referred to one. In severe cases, surgery may be needed to relieve the pressure on the tendons. Remember that the exact cause of this condition is unknown, so if it’s not going away after splinting and icing, make sure you see your doctor. If you’re having skier’s thumb symptoms after an accident, seek medical attention immediately. Pain management usually begins with applying an ice compress directly on the thumb for 35 minutes, twice a day, until the pain subsides. You should not move your thumb and should use a brace or wrap to keep the wrist and thumb in position. You can use over-the-counter pain relievers. If, after several days, there is no change, seek (further) medical attention, as surgery may be required. “Pain Between Thumb and Index Finger,” New Health Advisor; http://www.newhealthadvisor.com/Pain-Between-Thumb-and-Index-Finger.html, last accessed February 2, 2017. “Pain Management Health Center,” WebMD; http://www.webmd.com/pain-management/default.htm, last accessed February 2, 2017. “Avocado Soybean Unsaponifiables,” Arthritis Foundation; http://www.arthritis.org/living-with-arthritis/treatments/natural/other-therapies/, last accessed February 16, 2017. “Massage for Arthritis,” Arthritis Foundation; http://www.arthritis.org/living-with-arthritis/treatments/natural/other-therapies/, last accessed February 16, 2017.